Designed by Christy O'Connor Jnr, this course complements the Faldo Course, whilst taking advantage of the rich valley soil in contrast to the arid hillside, but offers no less of a challenge. Large areas of water demand accurate play and creative shot making, and these lakes and streams are maintained as a wildlife sanctuary. Christy said "I wanted one hole where it was just oranges. The whole of this part of the Algarve is blessed with thousands of acres of orange groves and I wanted to bring some inside the course as well". 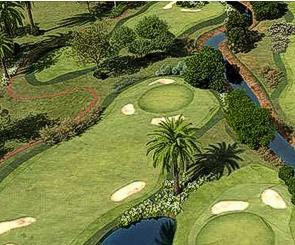 The 5th hole is a real beauty to play, with orange groves left and right of the fairway. There is also a huge orange grove to the left of the 4th hole. 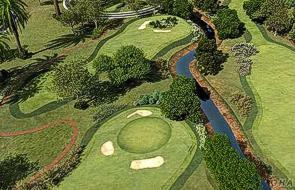 Christy also said "The course also has my version of the Amen Corner, starting at the 7th. We have a lake that runs from the 9th, through the 8th and into the 7th, so it's a kind of chain reaction and the 7th will be the first of it. The 9th is a real key hole of the golf course, the lake running not only to the right off the tee, but also to the left of the second shot. It is almost a two-part golf course. The 12th hole is guarded by the same lake that runs along the 8th hole, sitting on the lake with the water this time on the right just to give some variety". The 18th hole brings the course to a fantastic finish and offers a gentle climb with the river running along the right hand side. Christy described this hole as "A humdinger", stating "Once you get up here and look down on the golf course, you will feel you have been blessed". The Course is just 35 minutes drive from Faro Airport along the A22 motorway, 4 km inland from the beach resort of Armação de Pêra. A par five is kind of a nice hole to start with for amateur golfers. It is tricky enough, I suppose. There is a large lake to the right and Nick’s golf course on the left will be out of bounds because it has a different terrain to mine. 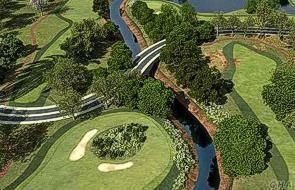 Although it will be a very generous fairway you will play down short of the river, over the river for the second shot. It is not a tough opening par five, which I believe the first hole shouldn’t be. Everybody is entitled to miss a couple of shots the first hole. It gets you going.